Thanbyuzayat War Cemetery, Plot A11, Row D, Grave 14, Age 35. Thanbyuzayat Cemetery, Australian Section, Gave No. 59. Funeral service was conducted by Chaplain F. X. Corry from 2/4th MG Btn. Tom Fury was one of about 90 men from 2/4th who had gone AWOL from ‘Aquitania’ anchored at Gauge Road, Fremantle on the evening of 15th January 1943. Having sailed from Sydney, the ‘Aquitania’ was headed to Singapore with about 3,000 troops including the 2/4th MG Btn. This group of men were not able to re-board the Aquitania prior to its departure about midday on 16th January 1942. They were then sent on a small convoy to Java, where it was intended they would be transhipped to Singapore. These were well-trained machine gunner whose skills were valuable to the Allied Forces. Before the Convoy docked at Java there was a change of plans – the men were to remain at Java and reinforce the Allied Forces. Singapore was confirmed to fall. Fury was selected with ‘A’ Force Burma, Java Party No. 4, Williams force. Read further about Williams Force. 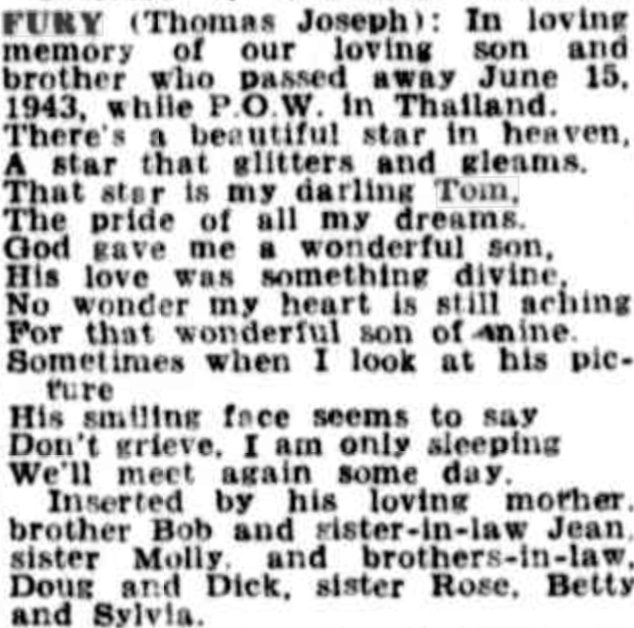 It was during one of the Allied Air raids that Joe Fury was killed at Thanbyuzayat Camp, Burma in June 1943. Please read further about Fury’s family receiving news of him. 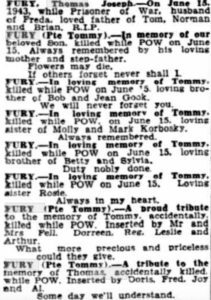 Tom Fury’s parents Thomas Joseph (Snr) born 1881 Dublin, Ireland married Sarah Fyshe born 1888 at East Coolgardie about 1907. Tom (Jnr) was their only child. Sarah Fysche remarried to Robert Gook and had a large family and stepbrothers and stepsisters for Tom. 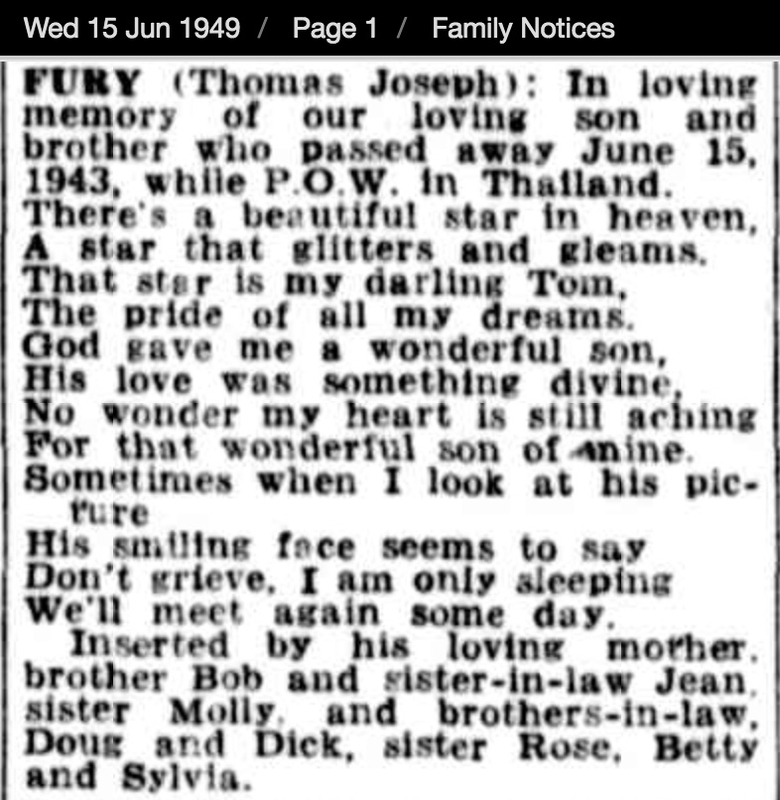 (It is believed Thomas Joseph Fury Snr died in February 1951). 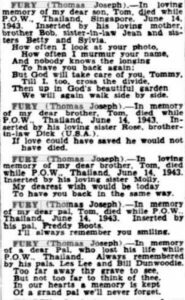 Tom Fury married in Perth in 1931 to Freda Violet Turner (or Ives). Tom and Freda had three sons Tom, Norman and Brian. He was employed as a miner in Kalgoorlie where his family had lived throughout their lives. Tom was also for a few years a hurdle jockey. 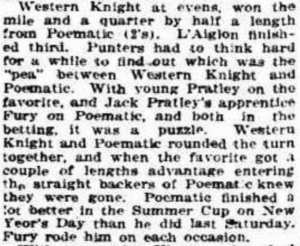 Further research has revealed Tom Fury (Snr) was also a jockey in Kalgoorlie. He rode for Jack Pratley. Fury (Snr) enlisted into AIF in 1917. He named Jack Pratley as his NOK, recording he was a brother-in-law – whether true or not, we do not know! Elizabeth Ann Pratley’s name was also included. Elizabeth’s address was Manageress of National Hotel, Kalgoorlie. This was also the address recorded for Fury (Snr). 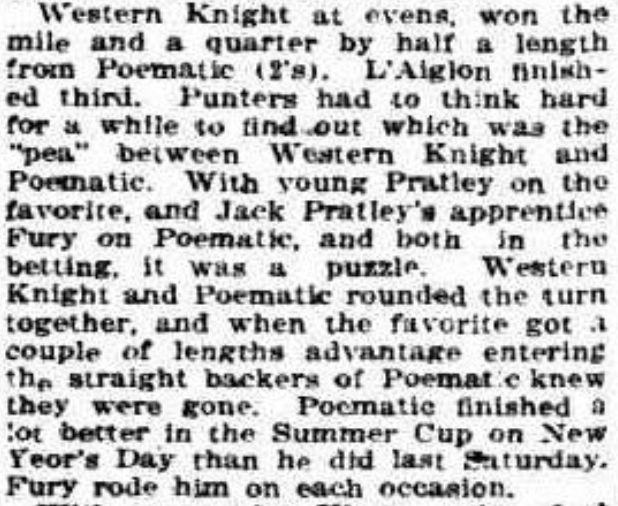 Of interest is that Jack Pratley also enlisted (and this is probably why Elizabeth Pratley’s name was later included.) Pratley enlisted with AIF joining 3rd Field Ambulance at about the time Fury was discharged. Of interest, and quite unrelated to Tom Fury Jnr is Jack Pratley’s informal AWM photo with taken with Private Leonard Darcy of the 3rd Australian Field Ambulance at Blackboy Hill Camp in WA. The two men were in the same unit in training camp with Private John Simpson Kirkpatrick, ‘The man with the donkey’. Fury (Snr) was discharged from AIF within 4 months. He had been absent without leave on several occasions, and there appears to be a problem with maintenance for his son. Fury (Snr) has signed a document confirming a percentage of his income will be paid to former wife Sarah with the words in large print “In Protest”! Fury (Snr) wished to have Elizabeth Pratley be paid maintenance for his son; we do not believe Elizabeth was guardian of Thomas (Jnr) and that he was with his mother, Sarah. It is apparent relations between Tom (Jnr’s) parents were far from friendly and in fact hostile. There is no doubt father desparately loved his son. Tom (Snr) had included a carefully worded will instructing all his worldly belongings were to go to his son, and again instructing Elizabeth Pratley was to be his guardian. Aside from these legal problems Fury (Snr) had health issues. He was officially diagnosed with Keratitis, an eye condition. Fury claimed his vision was limited. However the final medical report wrote Fury’s eyesight would improve if only he stopped drinking whilst undergoing treatment! 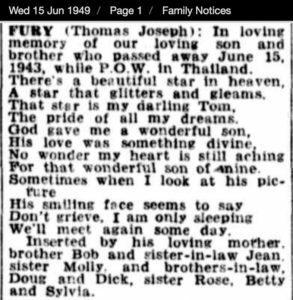 It is believed Tom Fury’s family moved to live in Perth in the mid 1930’s. This was recorded in the newspapers of 1949.